Dermarolling / Microneedling / Re: Face Map? Practically, certain areas on the face (such as around the eyes, above the lips, the nasolabial fold etc.) can only be rolled in one direction (either vertically or horizontally) and you should not worry too much about spreading the pricks evenly. Do it in a way that is feasible and comfortable. It does not really matter which direction you roll. Just lift the roller after each roll so that the needles do not fall exactly into the same channels (that happens if you roll back and forth without lifting). Something with a substantially lower hardness can never damage something with a substantially higher hardness. You can scratch a pice of chalk with a piece of steel, but you can't scratch a piece of steel with a piece fo chalk, not matter how much and how long you try. The bristles of a toothbrush have a very, very low hardness and stainless steel is very, very much harder (many orders of magnitude, it's an exponential scale so steel is millions of times harder than the plastic used in a toothbrush). You're raising a valid and interesting point, and indeed we have been worrying about that possibility as well. Dermaneedling is a "game changer", a "paradigm shift" in skincare in the sense that extremely effective treatment suddenly becomes cheaply available to the masses. Suddenly, anyone with a few dollars and some effort and patience can greatly improve their acne scars and stretchmarks, something that used to cost thousands in a specialized clinic with lasers and the like. We will suddenly start reading media reports how "home rollers" died a horrible, drawn-out death of gangrene and their arms and legs and eventually their head had to be amputated etc. etc., with a warning about "ruthless cynical online scammers" selling "dangerous fraudulent needle devices". Then customs officers around the world will be notified not to let dermaneedling instruments through. The Breastlight was declared a "fake and dangerous device" and its vendors criminals. The device was then banned worldwide. Not because it's illegal by any law, but just because. By some type of executive order or request to countries. And they complied. So this scenario plays itself out whenever the profits of the established order are threatened. Something that is cheap and that really works is a severe threat and they will fight tooth and nail to get it banned. Skin 44, thank you for helping the others by writing about your experience. and copy there what you said about our Tretinoin cream helping with your cystic acne remains? Dermarolling / Microneedling / Re: I LOVE Infadolan! Anyone else?!! Oh, I see, the scar is much lower. In this case, use a 1 mm dermastamp on the main scar and our single needles on the small raised lines that are vertically crossing the main scar. Stamp and needle every 10 to 14 days. Please send photos of your neck after a couple of months. Suctioning should only be used on scars that very likely are tethered (the rolling type of acne scars) or on scars that have resisted all other treatments (in the latter case suctioning is experimental, as a last resort kind of self-treatment). Nothing prevents you from going to a doctor for a real subcision but our website is aimed at self-treatment and real horizontal subcision to cut the fibers is too risky to be done as self-treatment. It can leave scars. I understand that it is difficult to walk around with bruises. You should try everything else first and only if it doesn’t help, add suctioning. Scars are in general very difficult to improve with all current methods, even the most advanced and expensive ones. A combination of approaches is often necessary. Unfortunately, there is no magic solution and if nothing works, you have to start with "try and see" methods until you basically exhausted your options. Many of our customers spent thousands of dollars on laser treatments or acid peels without any improvement. If the suction method does not improve your scars, you lost 19 dollars. I don't think a garden hose will help but I suggest using a new toothbrush purchased for that purpose. With this model, it is possible to get some discoloration caused by blood staining at the needle base. A good way to clean this up is to take a plant mister and set it to spray a small, tight stream of water. Then spray the stamp while holding it needles-side up. This cleans it out completely in a matter of seconds. Operating instructions for the DermaJet have been available for about a week in our dermaneedling instructions. There is a chapter for the DermaJet. Dermarolling / Microneedling / Re: Copper Peptide Serum with or without moisturizer? Thank you for reporting your experience! Please keep us posted. Our copper peptide serum is more or less moisturizing enough for normal skin but not for dry skin. It also depends if you live in dry climate etc. I do not think that applying your moisturizer is too much. There is no other way then trying it. If you prefer, stop your moisturizer and see whether your skin gets dry. Give it a week and then decide to restart or not. Concerning your forehead, buy a regular 1 mm dermaroller. 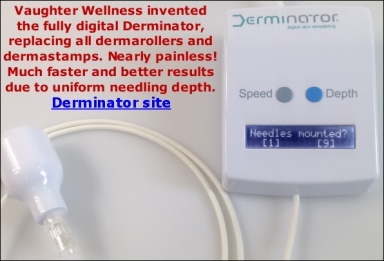 If you get no improvement in six months, add a 1.5 mm dermastamp or the single needles. To treat the scar from your thyroid gland operation is a bit tricky because it is in the middle part of the neck, below the Adam's apple. I would not recommend longer needles than a 0.5 mm dermastamp.